Investment banks are a particular type of financial institution that primarily work in ‘higher finance’, helping large organisations access the capital markets to raise money for expansion or other needs. Here, we will look at how an industry that is integral to the UK economy generates income, some of the risks involved and the various areas of graduate work. Raise equity capital (e.g. helping to launch an Initial Public Offering (IPO) or creating a special class of preferred stock that can be placed with refined investors such as insurance companies or banks). Raise debt capital (e.g. issuing bonds to raise money for large scale projects). Insure bonds or launch new products (e.g. credit default swaps). Provide expert corporate finance advice (e.g. deciding how much debt or equity might be needed, and on what terms to suit the needs of both the issuer and potential investors) and distribute new issues of securities with investors. Two main areas of interest in investment banking for graduates are typically Mergers & Acquisitions (M&A) and Proprietary Trading. M&A refers to the consolidation of multiple companies. A merger is a combination of two companies to form a new one. An acquisition is when one company buys another, but no new company is created. This refers to when a bank trades on its own account to generate in-house profit. This may involve taking analytical positions within limits which are carefully calculated and controlled in order to prevent exposing the bank to dangerous levels of risk. In recent years, the growth of this aspect of investment banking has led to increased risk-taking and in some cases substantial losses. Having access to substantial amounts of capital is essential to help finance large-scale expansion or development; selling securities to a wide range of investors and, if necessary, across several markets in different countries is an effective way to raise large amounts of capital, without any investors being left open to too much risk. Investment banks are often divided into two departments: the ‘buy side’ and the ‘sell side’. The ‘buy side’ works with pension funds, mutual funds and hedge funds and assists the investing institutions in maximising their returns when trading/investing in securities like stocks and bonds. The ‘sell side’ typically refers to selling shares of newly issued IPOs, placing new bond issues, engaging in market making services, or helping clients facilitate transactions. Market making consists of holding shares in order to enable trading – being in a position to both bid for and sell shares. Many investment banks’ activities are also organised into three categories – front office, middle office, or back office services. Front office investment bank services typically involve direct engagement with clients and market participants. Activities include M&A, Corporate Finance and Professional Investment Management for institutions or high net worth individuals, Professional Analysis of companies and markets and Investment Strategy Formulation. Middle office investment bank services include specialist activities like treasury, compliance with government regulations and restrictions for professional clients as well as risk management. They also include Capital Flow – monitoring the money coming in and out of the firm; which determines the amount of capital the company needs to keep available so that it doesn’t get into financial difficulty. This feeds back into the front office activities by deciding the scale of what they can do. Back office investment bank services include the operational activities that enable banks to operate efficiently. 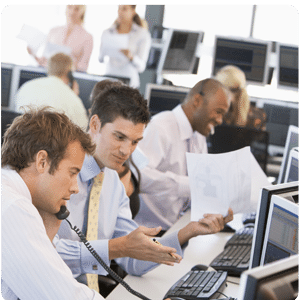 They handle things like trade confirmations, ensuring that the correct securities are bought, sold and settled for the correct amounts. They are also responsible for the software and technology platforms that allow the traders to do their job; making sure that they are the latest models and functional as well as creating new trading algorithms and more. For more information on technology in finance click here. Investment banks are often global, well-known brands such as Bank of America Merrill Lynch, Barclays, BNP Paribas, Deutsche Bank, Goldman Sachs and UBS. Responsible for raising and transacting huge sums of money around the world, investment banking can generate substantial consequences, both positive and negative, and therefore has been seen as both the most attractive and the most destructive area within the financial services industry. Investment banking is constantly under scrutiny in the press, often garnering negative coverage. The people that tend to succeed in investment banking are cool under pressure, resourceful, innovative and able to keep a level head in intense situations. As Europe’s largest international banking centre, roughly half of European investment banking activity is conducted in London. Participants play a key role in the business world and the financial rewards for those who are successful can be considerable as it is one of the best paid areas in finance, but the competition and pressures of work combined with long hours can be strenuous. Job satisfaction and security can be affected by the state of the market with cycles of boom and bust. It is essential that those who work in this sector remain aware of economic trends, market conditions and risk management. Constantly in a state of flux, the future growth and expansion of the investment banking industry will bring with it a wealth of exciting opportunities and possibilities for the right graduate.